Wetlands act as kidneys of land and facilitate remediation of metals and other harmful pollutants through uptake by aquatic macrophytes. The aim of the present study was to investigate metal concentrations in sediments and plants, sources of metal origin, and contamination level in Uchalli Wetland Complex. Sediment samples were collected from 15 randomly selected sites. Metal concentrations (Cd, Pb, Ni, Cu, Zn, Cr, As, Mn) in sediments and macrophytes were determined during summer and winter seasons using the inductively coupled plasma technique. Metal concentrations in sediments during summer and winter seasons were in the order as follows: As > Mn > Zn > Cr > Ni > Cd > Pb > Cu and As > Mn > Zn > Cr > Ni > Pb > Cd >Cu respectively. All analyzed metals were within European Union (EU) limits. In macrophytes, these metals were in the order as follows: Mn > As > Ni > Zn > Cr > Cd > Cu > Pb and As > Mn > Zn > Ni > Cr > Cd > Pb during summer and winter seasons respectively. 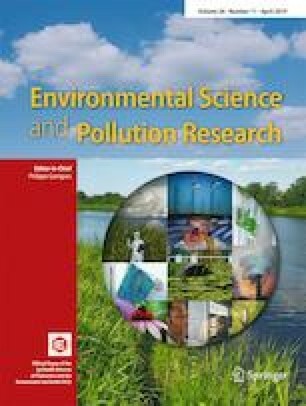 Contamination degree (Cd) (1.023–5.309) for these lakes showed low contamination during both seasons; mCd values (below 1.5) showed very little contamination degree, while the pollution load index (0.012 to 0.0386) indicated no metal pollution in these lakes. PCA applied on sediment showed that Pb, Zn, Cr, Cu, and Cd had anthropogenic sources of origin. As and Mn were due to natural processes while Ni could be resultant of both anthropogenic and natural sources. PCA on macrophytes showed that Ni, Pb, Cr, Zn, Cu; Cd, As; Mn had anthropogenic, natural, and anthropogenic + natural sources of origin. The study concluded that metal concentrations in sediments were not up to dangerous level.